Marine Electronics provide worldwide, 24-hour, online customer support, mes- sage delivery confirmations and notice of satellite messages. Sweden, has formulated a new concept for pilots — a compact and portable AIS Pilot Case. Transponder as the main component, which is transported onboard as a single unit with full AIS capability, such as: tracking of own ship and all other AlS-transponder equipped ships on the ECS and logging of transponder data. Glonass satellites, the system provides worldwide positional and speed accuracy of 15 m and 0.2 knots, respectively. Cor- responding differential mode accuracies, derived from an integral multitrack differential beacon receiver, are 1 m and 0.1 knots. The system is designed for any type of marine navigation operation, as well as specialist applications, namely hydrographic surveying, buoy positioning and oceanographic research. GPS/chart plotters, utilizing V the latest in high-detail, seamless NT cartography from C-Map. The new Chart Mas- ter plotters are fast and powerful navigation aids. The model 7M is a monochrome LCD with optional GPS or DGPS sen- sor; model 7MI is a monochrome LCD with a unique built- in GPS antenna; Model 7C is a color LCD unit with option- al GPS or DGPS sensor. A full array of advanced navigation features, such as worldwide detailed chart coverage includ- ing bathymetric lines, natural features, spot soundings, ports and services and navigation aids is available. 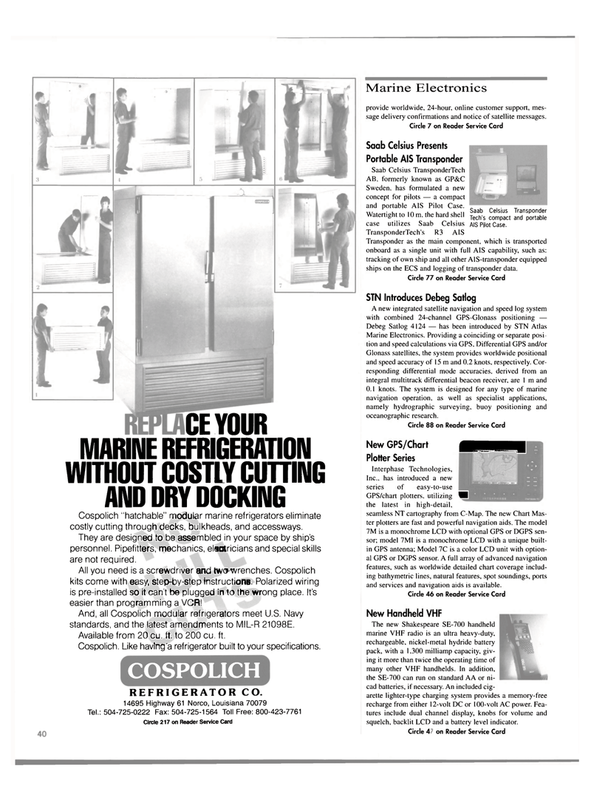 Cospolich "hatchable" modular marine refrigerators eliminate costly cutting through decks, bulkheads, and accessways. They are designed to be assembled in your space by ship's personnel. PipefittetpJJechanics, electricians and special skills are not required. All you need is a screwdriver and two vvrenches. Cospolich kits come with easy, step-jpy-step instructions. Polarized wiring is pre-installed so it can't be plugged in to the wrong place. It's easier than program mfhgaVCR! And, all Cospolich modular refrigerators meet U.S. Navy standards, and the latest amendments to MIL-R 21098E. Available from 20 cu. ft. to 200 cu. ft.
Cospolich. Like having a refrigerator built to your specifications. The new Shakespeare SE-700 handheld marine VHF radio is an ultra heavy-duty, rechargeable, nickel-metal hydride battery pack, with a l ,300 milliamp capacity, giv- ing it more than twice the operating time of many other VHF handhelds. In addition, the SE-700 can run on standard AA or ni- cad batteries, if necessary. An included cig- arette lighter-type charging system provides a memory-free recharge from either 12-volt DC or 100-volt AC power. Fea- tures include dual channel display, knobs for volume and squelch, backlit LCD and a battery level indicator.